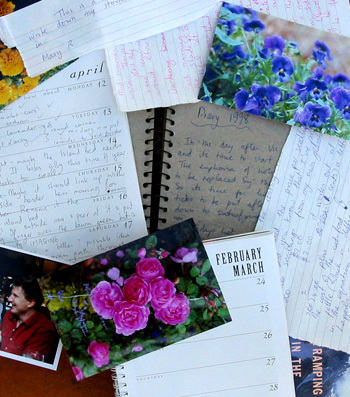 I've always enjoyed gardening and writing diaries. When I first arrived at Mooseys in 1994 it didn't occur to me to combine the two, so those heady early days are poorly recorded. I soon became an obsessive gardener, and the obsessive garden writer wasn't far behind. My earliest scribblings in notebooks consist of important advice copied from books, and my own lists - highly detailed and highly impractical, often containing expensive plants to buy. Lists of garden tasks came later, in an attempt at gardening self-discipline. Another year in the garden. Aargh! No - let's start this again. Another lovely year in my lovely garden. And 2019 is divisible by three. That means that each gardening day can be broken down into three parts - weeding, weeding, and then weeding. Aargh! 2016 is the Year of the Better Gardener, namely me. I'm going to spend all year doing my very best to be better, hee hee. Seriously, the plan is to concentrate on consolidation, rather than innovation, and enjoy myself. Hope you enjoy reading my 2016 Gardening Journal. 2015 - a new year, new expectations, the same garden - with the same older but wiser gardener? Aha! We'll see. As the years go by I seem to become more random and rather less responsible. But I love my garden even more, and I try my very best to be a good gardener. That's all that matters, really. Yippee! Another gardening year - it seems like just yesterday that the Moosey garden was an untamed toddler, and the garden journal was as young and fresh as a daisy. Now both are nearly twenty years old! Surely by now I've matured as a gardener? Ha! In 2010 I am transforming into a budget minded gardener, one who will exercise restraint and act sensibly at all times. This new improved attitude should be reflected in my 2010 journal. Let's see how I make it through the year. Another year, more plans, more garden expansions, more spending on new shrubs and plants - and more journal pages in which to celebrate! When will my garden be finished? Hopefully, never... Well, certainly not in the year 2008! Ten Moosey Garden Journal years have passed - my goodness, how time flies. And so much in the garden changes, too - as my plants grow far too big for their alloted spaces. But I still have far too much to write about. And I have some some serious questions. How many new roses can I justify purchasing? Where will I possibly plant them all? 2003 starts out as any normal year, but ends in triumph, as I become a retired person, ready to try my hands at full-time gardening. There's an odd twist healthwise, as I discover I'm not superwoman. The garden is, of course, completely oblivious to all this drama. My 1998 journal contains very random writings. These were the days when I tended to scribble lists in notebooks which I then promptly lost. I was definitely in my growth phase as a gardener - not totally sure of things, still trying to do what the sensible gardening books said.